Planning and Paddling Log: A User Guide and Trail Journal for Northern Forest Canoe Trail Adventurers By Katina Daanen If after reading Upwards by Laurie Apgar Chandler about paddling the 740 mile Northern Forest Canoe Trail you feel over whelmed at the distance you may prefer to consider sec- tion paddling. Most of us do not have 2 months where we can leave our busy lives behind to enjoy a big adventure. It is more likely that we may get a weekend or perhaps a string of 3– 4 days for which to dedicate to an outdoor adventure. The Planning and Paddling Log is designed to be a tool to assist in choosing which section to paddle. It is also designed to allow you to document your journey. It can help you record what the weather was like, how many miles you traveled, what kind of wildlife you encountered as well as your personal ob- ser vations. 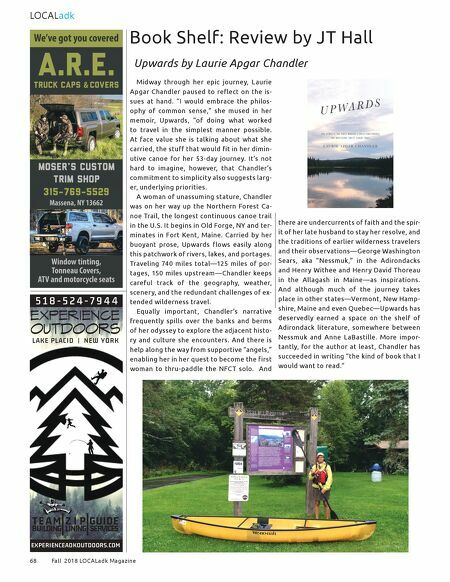 We recommend this book as a tool to help you learn about, plan and record your paddling adventures along all or sec- tions of the beautiful Northern Forest Canoe Trail.